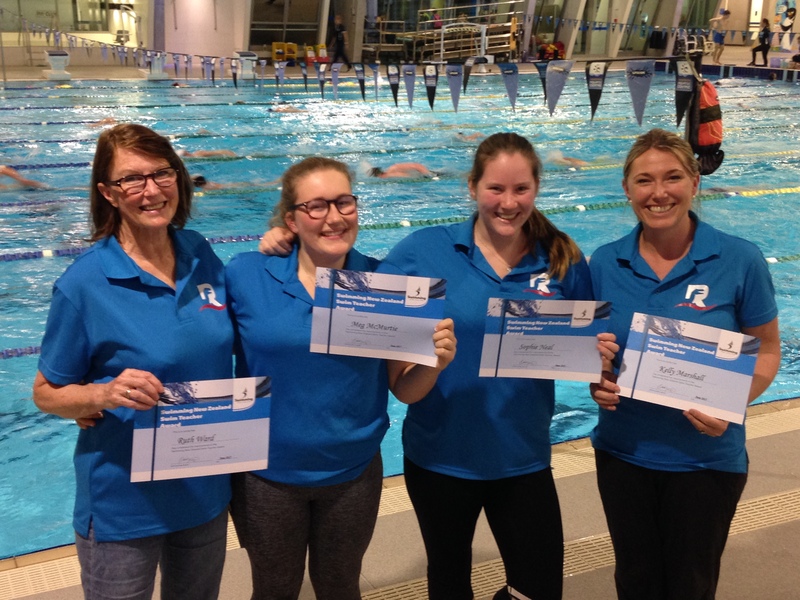 Four volunteer coaches from Raumati Raptors Swimming Club in Kapiti (Wellington) have completed Swimming New Zealand’s Swim Teacher Award qualification following the completion of their written workbooks and practical assessments. The coaches attended the course together and have been working co-operatively to complete the workbook. All four coaches are part of the Tuesday night team that are working with swimmers who are learning to compete. The Tuesday night session offers swimming development and beginning to swim techniques while promoting the correct strokes and skills used by competitive swimmers and racing in teams. It runs every Tuesday night from 5pm to 6pm during school term and sessions range from 30 to 60 minutes. The club offers sessions in both the learners pool and the main pool and swimmers can progress from basic learn to swim through to competitive swimming skills during this time. Raumati Raptors focus on offering swimming in a fun club environment. They offer regular fun race nights and enjoy seeing as many of their swimmers participating as possible. The best thing about their Tuesday Club Night is the club atmosphere where swimmers start swimming and learning together, have fun, work on skills and make friendships along the way with the volunteers making it all happen. Congratulations to Ruth, Meg, Sophie and Kelly for completing your Swimming New Zealand Swim Teacher Award. Your lessons were fun and interactive and your swimmers were producing some great results. Well done and keep up the great work! Thank you to all volunteers within swimming. You have our heart-felt appreciation as you are a part of building stronger, more vibrant swimming communities through your volunteer service.